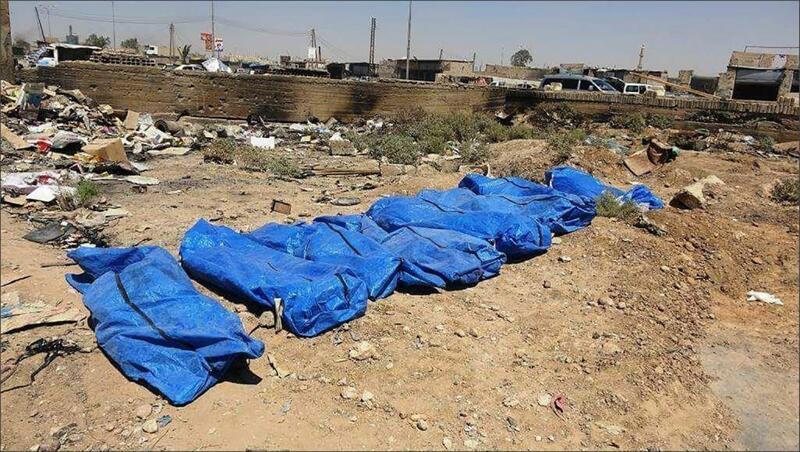 The Syrian Network for Human Rights said in a report issued on Thursday that identifying the bodies in mass graves in Raqqa province was an international responsibility, saying that there were about 4,247 missing people in the province whose fates needed to be uncovered. The report said that about 2,323 civilians in the province had been killed, including 543 children and 346 women, during the “Euphrates Rage” battle—from November 2016 until October 2017. Most of them were killed by the Syrian Democratic Forces (SDF) and the International Coalition and then buried by their families in parks and sports fields, as well as in household yards, because of their inability to access the Tel al-Beea cemetery due to the siege imposed by the SDF on the city of Raqqa specifically. The report said that the biggest portion of bodies in the mass graves are victims of the SDF and the International Coalition, or victims who were killed by the Islamic State (ISIS), including civilians and regime forces, or those killed by ISIS during the fighting, or hostages or people killed during fighting with armed opposition groups, or people who were arrested by Assad’s forces when they were in control of Raqqa. The report issued statistics that discussed the toll of civilian victims who were killed in Raqqa province by the parties to the conflict from March 2011 to March 2019. At least 4,823 civilians have been killed, including 922 children and 679 women. The Assad regime killed 1,829 of them, while Russian forces killed 241 civilians. ISIS killed 942 civilians, and three civilians were killed by the armed opposition. The SDF killed 308 civilians, while the International Coalition killed 1,133 civilians, and at least 367 were killed by other parties. The report indicates that there were at least 4,247 missing people from the province, including 219 children and 81 women from March 2011 to March 2019, including 1,712 people who disappeared at the hands of Assad regime forces, and 2,125 were disappeared by ISIS, and 288 by the SDF militia, and 122 by armed opposition factions. The report said that the biggest challenge faced by the team was the lack of equipment. The team only has access to manual digging equipment and basic tools, while there is also a lack of experts in excavation methods and the transportation of bodies, which doesn’t damage criminal evidence, in addition to the major lack of specialized forensic doctors or a laboratory where the team can gather and record samples taken from bodies (such as bones, hair and teeth), so that samples can later be taken from residents and DNA analysis run for comparison. The report called on the US-led International Coalition to give more logistical and material support to the operations to remove bodies, and to pressure the SDF to allocate a larger portion of funds for this, so that evidence gathered is not subsequently tampered with, as well as to take all possible measures to protect bodies and to carry out all possible efforts to identify the dead and to provide appropriate burials in cemeteries with clear markers. It stressed the need to establish a laboratory in which samples taken from bodies can be gathered to compare them with samples from families of the missing and to create a centralized public register for the missing and to speed up the process of clearing mines that are spread widely, and which have a major impact on the return of civilians to Raqqa city and on the process of removing bodies. The Syrian Network for Human Rights called on the International Commission on Missing Persons to hold a training workshop for the local first responders team and to provide them with the necessary skills and consultation; to carry out all possible efforts to help identify the missing and disappeared people, which will strengthen the process of transitional justice in Syria; to more greatly activate the work of the central agency to search for missing people in Syria as soon as possible.